In this daily series most entries have been 'main' Mario titles across portables and home consoles, with just a couple of spin-offs and cameos making the grade. Yet 1994 was a quiet year for Mario, as we were between major arrivals - that said, there were a couple of titles that changed up the franchise in good and not-so-good ways. Let's start with the good. In a move designed to tie-in a new experience with a familiar brand, we had the clumsily-named Wario Land: Super Mario Land 3 on Game Boy. Wario first appeared as Mario's alter-ego and as the villain in the brilliant Super Mario Land 2: 6 Golden Coins. Nintendo had continued the trend of expanding the Mario universe with its Game Boy series, and clearly appreciated its new villain enough that it decided to explore gameplay options that would be unique to the character. Bolting Super Mario Land 3 onto the title did make sense from a marketing perspective, it can be argued, especially considering the fact Wario was introduced in the Land series. Many of the mechanics and ideas in Wario Land did go on to become the standard and established controls and approaches for the character. The obsession with coins, treasure and wealth is core to the story, and Wario has his shoulder charge move that's become an ever-present in his platformers. As opposed to Mario-style power-ups, Wario had three helmets that enhanced his abilities - the Bull helmet improved his shoulder charge and allowed ground-pounding, the Jet helmet boosted his jump and allowed some flying, and the Dragon helmet opened up fire breathing. Each had pros and cons and were integral to the experience. Wario would, in future games, fly solo without the Mario name, and Wario Land still stands up as a real technical show-piece on the Game Boy; it's arguably one of the portable's finest games. We now come to our second and quirkier game in this entry - Hotel Mario. This is a unique inclusion as it was on the Philips CDi; this system was the off-shoot of an abandoned plan to bring a CD-based add-on to the SNES. For those of you interested in history, let's not forget that this Philips partnership came after the remarkable tale of the so-called SNES PlayStation. When Nintendo decided not to pursue a CD-based add-on system, it maintained sufficient relations with Philips in allowing it to utilise key IP for its CDi platform. An extraordinary decision in the modern context of Nintendo's cautious approach to its IP appearing away from its own hardware, it delivered legendarily disappointing licensed games on the system. The Legend of Zelda CDi titles are examples of projects rushed and pushed out by an ill-equipped third-party studio, though Hotel Mario was produced by Philips' own Fantasy Factory team. Initially Philips planned multiple Mario games, including an ambitious Super Mario World-style title called Mario Wacky Worlds; ultimately only Hotel Mario was released. A key feature that showed off the CD technology was a range of animated sequences throughout the game; they may look crude (and rubbish) now, but in the early-to-mid-nineties the idea of video running off a disc was pretty impressive; it's all about context. The gameplay itself blended puzzle and action styles, as you run around a single screen moving between floors and closing doors; some power-ups are also thrown in. It was modestly received at the time and has been panned retrospectively in more recent years. Ultimately it's a simplistic, unremarkable game on hardware that flopped. It's an intriguing side-show in Mario history, though, due to that unique relationship between Nintendo and Philips. In not only allowing Philips to use two key franchises but also failing to take part in the development process, Nintendo showed a laxness in IP management that seems almost inconceivable today. We may still get slightly iffy Mario spin-offs published by Nintendo but developed by other studios, but we're doubtful that a release quite like Hotel Mario will ever happen again. That's what I find most amazing about those CDi games, that Nintendo gave them so much freedom with the IP. I'd love if I knew more details about that deal. I mean it would be one thing if the deal was for Nintendo to develop and release titles on the system, but to give Philips free reign like that? Unbelievable, I just can't imagine what made them do that. "I hope she made LOTSA SPAGHETTI!" If I recall, all of the voice acting was done by one man...... including Princess Peach. Obviously the Zelda CD-i games win when it comes to hilariously bad voice acting. I still own the original cart for Wario Land and I have had good times playing the game mainly on the GBA when that system was released and I loved how you could change the colors for GB games when played on the GBA. @NintendoFan64 "It's been one of those days..."
I actually find the first Wario Land to be a pretty bad game. I LOVE the sequels, but the first one is incredibly bland. The levels are extremely repetitive, and almost all the enemies function in the same way, so the gameplay never really changes. Warioland was really one of the best platformers on the Gameboy! I wish the 3ds got its own Warioland adventure, and I'm holding out for that possibility. Wario Land is fantastic and so are the sequels. I really wish Nintendo would return to that franchise but hey, Wario's victory music in Super Mario Maker is a step in the right direction. @WaveBoy What's so bad about NSMB??? You think Philips intentionally made sh*t Mario and Zelda games just to punish Nintendo for breaking the hardware agreement they had? @Kirk I don't think that's the case. The chance to make Mario and Zelda games was a golden opportunity for them to make the console more appealing. I think there was a bit too much at stake for them to screw up on purpose. The original Wario Land is phenomenal. IMO it is better than even Super Mario World. A lot of touches of brilliance in that game... My favorite being how several of the levels get altered as things happen in the overworld, making their replays significantly different. I think by the time Nintendo had decided it didn't want to use CDs, it was too late. As a way out of the deal, Nintendo reluctantly allowed Philips to use their IP. I don't think they had much choice tbh. Hence why they weren't interested in helping them make the games. No love for 6 golden coins? Shame. Remember... Where there's smoke, there's fire! I'm not talking about the original DS NSMB, I'm talking about NSMB 2 which was an unneeded sequel, a total cash grab that once again recycled and abused the same visual asthetics and sound of the past 2 NSMB games while making teeny tiny alterations & minuscule adjustments. It's not a bad game by any means, but probably the most underwhelming, 'tired' and unnecessary traditional Mario game in video land existence! I give Hotel Mario a 7.8 out of 10. Too many toasters. @sketchturner Completely agree! Wario Land is better than Super Mario Land 2! On the original Game Boy, it's right up there with Donkey Kong '94 and Pokemon Red/Blue. Bowser has his own brand of bread? 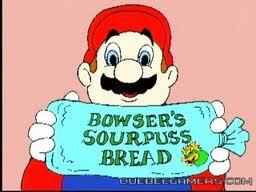 "Bowser Bread, that's what I- GRAAAUGH"
@WaveBoy I'm with you there. NSMB2 is just a romhack/mod of NSMBW. Newer Super Mario Bros Wii (an excelent NSMBW mod) should have been endorsed by nintendo instead. All 3 Wario games on the gb ruled. The 3rd one was off the hook. @ekreig Yeah, I'm just [half] joking. Companies usually aren't that childish about such things. Kirk, I'm not sure you're considering how much the poor quality of the Nintendo licensed titles truly affected the CDi's chances. Keep in mind, the CDi released less than 10 years after the crash. It was new technology that wasn't ready for consumers. It was rushed, and Philips lost millions. Not tens of millions, but hundreds of millions. The company was near bankrupted as a result of the CDi's complete and utter failure. They have barely touched the market since and only in a support role. To suggest they dragged Nintendo through the mud, not knowing what that would do to their own reputation, it's more than a bit ridiculous. HEY YOU! GET OFF OF MY CLOUD!! Wario Land.....an amazing game really. Where's that new Wario game Nintendo? Complete Mario Land series (1-3) and Wario Land (1-3) is the best collection out of GB library.